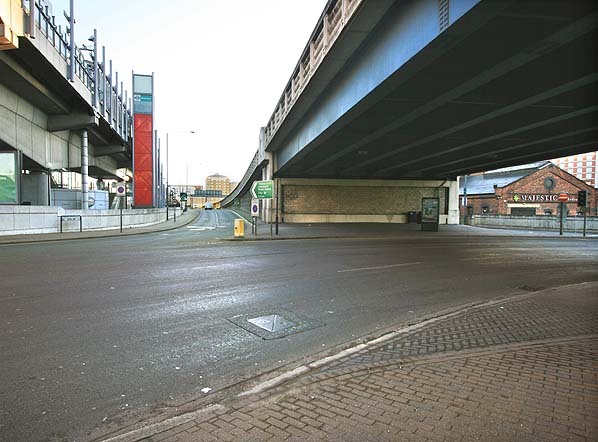 Location: Site is now beneath the on slip road for Aspen way, adjacent to the DLR's Blackwall Station. Notes: The original Poplar Station was sited on the west side of Brunswick Road but was resited to the east side of the road in c.1845. 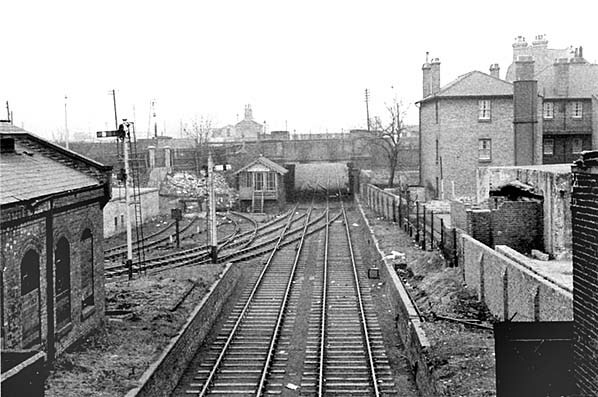 Despite this very early closure the platforms remained intact until the late 1960's when the cutting was filled in. 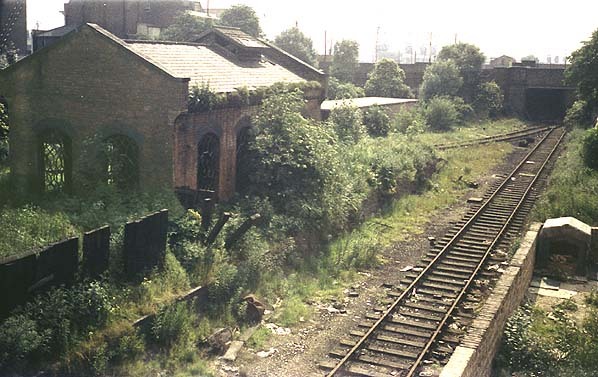 A brick building on the up platform had no connection with the station and was part of the hydraulic pumping system for the Midland Railway Dock branch. The L & B eventually sought new partners to increase revenue with several schemes being promoted. The East & West India Docks & Birmingham Junction Railway (later to become the North London Railway) proposed a line from the L & NWR at Camden to Poplar and eventually it was decided that this should run into the Fenchurch Street terminus via a connection at Bow. This scheme required a change of gauge and conversion to steam haulage for the L & B and the extension from Stepney - Bow opened on 2nd April 1849. By the beginning of 1854 the Eastern Counties Railway were running trains into the City terminus from their Enfield, Hertford and Brentwood lines; the two companies jointly established the London, Tilbury & Southend Railway which opened on the 13th April 1854. On 19th June 1865 the London & Blackwall Company obtained an Act that authorised the building a line from a junction with the London & Blackwall at what was to become Millwall Junction across the Isle of Dogs to a terminus at North Greenwich. Progress on the line was slow opening as far as Millwall Dock Station on the 18th December 1871 and reaching North Greenwich on the 29th July 1872. Looking east from Preston's Road bridge towards the first Poplar Station in March 1962. The line to the right leads to the Midland Railway Dock. 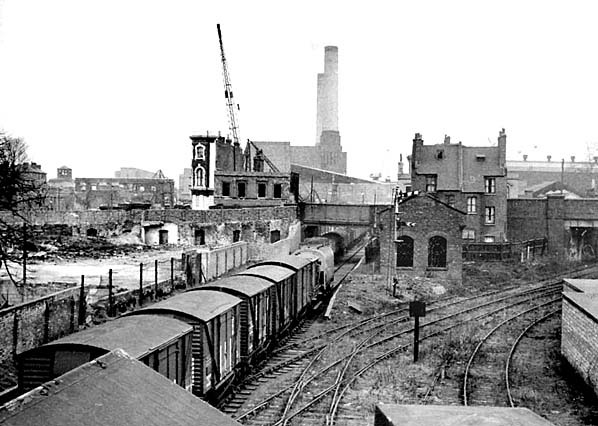 The brick building to the right of the platform is not of railway origin and probably house hydraulic pumping equipment for the docks. 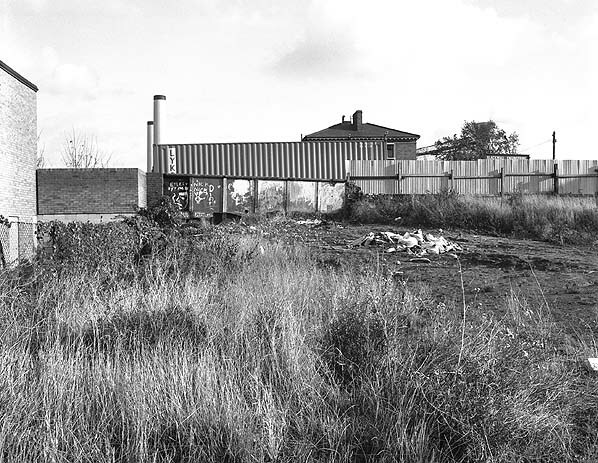 The site of Poplar (1st) Station looking east in April 1981. The cutting has been infilled but at that date the bridge was still there. The building beyond the bridge can be seen in the 1965 picture above. 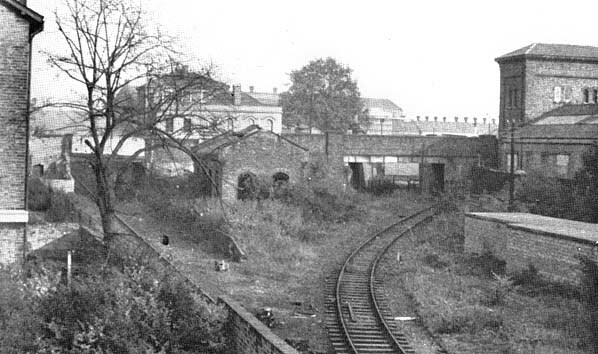 Midland Railway Dock line can be seen in both pictures. Recent aerial view showing the site of the 1st Poplar Station. 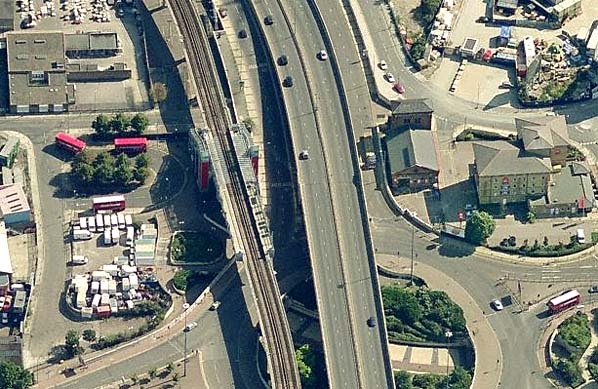 The accumulator tower adjacent to the Midland Railway Dock line can be seen to the right of the flyover. It is now a Majestic Wine warehouse.